Shawna-Lee Perrin-- Tinkering away at my thesis this semester, a quote by the Mountainview MFA’s own Mark Sundeen guides much of my work: “All literature is longing,” he said. Using this statement as my Rosetta stone for writing, I keep thinking about Tell the Wolves I’m Home by Carol Rifka Brunt, which I read last spring. The novel, set in 1987, is narrated by a kid named June. June grapples with the confusing, sometimes scary, world of being a girl at fourteen; not fitting in at school, an ever-widening chasm between her and her family, and starting to see adulthood looming on the horizon. She also recently lost her Uncle Finn, the person she was closest to in the world, to AIDS, a disease about which little was known at the time. June’s ache at the loss of this connection is central, matched only by that of Finn’s longtime partner, Toby, who reaches out to June after Finn’s death. Together, they navigate grief, fear, and memory, finding a profound, though different, connection with each other. Brunt harnesses such an atmosphere of heart-twisting longing that it’s often painful; that pain is one that I strive to inflict on my readers. Margaret McNellis-- Of all the books on my reading list for my first MFA semester, Fever by Mary Beth Keane excited me the most—and it did not disappoint. Set in the early twentieth century, Fever describes the experience of Typhoid Mary beginning with her arrest. Keane artfully includes flashbacks to develop Mary’s character so that the reader sympathizes with her plight. Speaking of careful story-weaving, Keane also incorporates the theme of addiction into Fever. For Mary, her addiction is cooking and everything that goes along with it: the creativity and the prestige among the working-class residents of Manhattan. For her lover, Alfred, his addictions become a hurdle for them both as he first deals with alcoholism and a subsequent drug addiction. Keane expertly paints a vibrant vision of New York City at the turn of the century, filling in the details of Mary’s world in a beautiful economy of language that enveloped and transported me. I couldn’t put this book down; my only regret was that it took only two days to read. I wanted so much more, even though Keane tells a compelling and complete story. 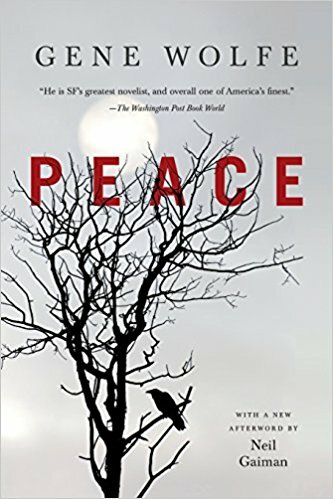 C. A. Cooke-- If you're looking for a book with multiple levels of theme and plot, but don't have six months to dedicate to David Foster Wallace, you will enjoy Gene Wolfe's novel, Peace. On the surface, the book seems to relate the life of an old man in the Midwest. As you continue through the narrative, you discover Wolfe is hinting at a story behind the story... One which is dark and sinister. Wolfe never directly tells you what is hidden. Rather, he hints at the darkness through the anecdotes and stories the characters tell one another, which shadow the courses of the narrator's life. At just over 250 pages, Peace is a novel which you can read in an afternoon, and come back to later to plumb its depths further. It is a story which will haunt you in all the right ways.